Outer space can be a spooky place. 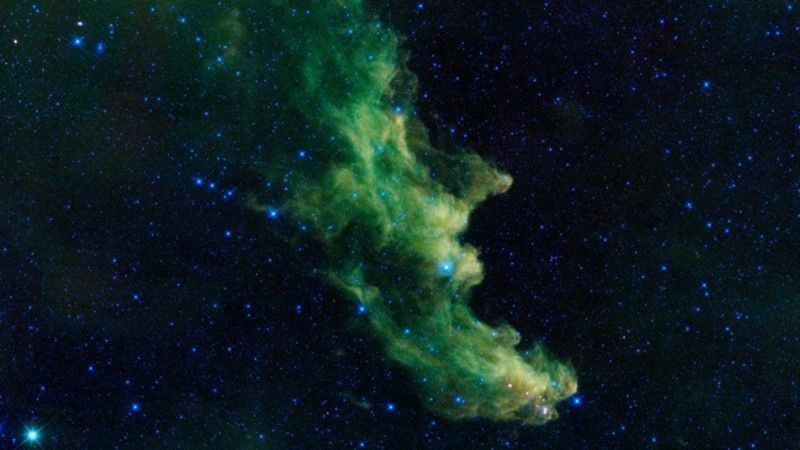 Halloween on Earth usually brings out the ghouls and werewolves in neighborhoods around the United States, but what are some of the most unsettling sights in space? From mysterious alien planets to ghostly nebulas, the universe is filled with oddly shaped objects that let the imagination run wild. If you want to try to spot the Witch’s Nebula this Halloween, look to the constellation Orion’s “knee” to possibly spot the cosmic witch. The nebula itself is hundreds of light-years from Earth. Halloween came early on the sun this year. Earth’s closest star took on a frightening look in an composite image taken by NASA’s Solar Dynamics Observatory in early October. Active regions of the star glow in a pattern that make’s the sun look like it sprouted two eyes, a nose and a mouth like a jack-o-lantern. The Hubble Space Telescope has seen the light of stars blown out from galaxies that were destroyed billions of years ago. A picture released Thursday shows a cluster of 500 galaxies located about 4 billion light-years from Earth. Stars orphaned from their original galaxies create the ghostly blue glow of starlight in the image. The stars now wander between galaxies in the cluster, according to NASA. A purple and blue-hued nebula shines in the Milky Way. The nebula (named LBN 483) looks like a wisp of smoke flying high into the universe. A moody, new photo of Jupiter shows the planet’s distinctive eye looking more like an actual eye than usual. The Hubble Space Telescope took this picture of Jupiter in April when the gas giant’s moon Ganymede passed over the planet’s eye, casting a shadow on the huge storm. “This [Ganymede’s pass] gave the giant planet the uncanny appearance of having a pupil in the center of a 10,000 mile-diameter ‘eye,'” NASA officials said in a statement.